Facing Critical Labor Shortage, Japan Opens Door Wider To Foreign Workers An aging population and low birth rate have led lawmakers to accept semi-skilled non-Japanese temporary laborers. In front of Japan's parliament on Friday, people stage a rally against the bill to allow more foreign workers into the country. Japanese lawmakers have passed controversial legislation expanding the number of semi-skilled foreign workers who can live and work in the notably insular nation for up to five years. Japan has been pressed to make the change because of a critical labor shortage that results from its rapidly aging society and low birth rate. 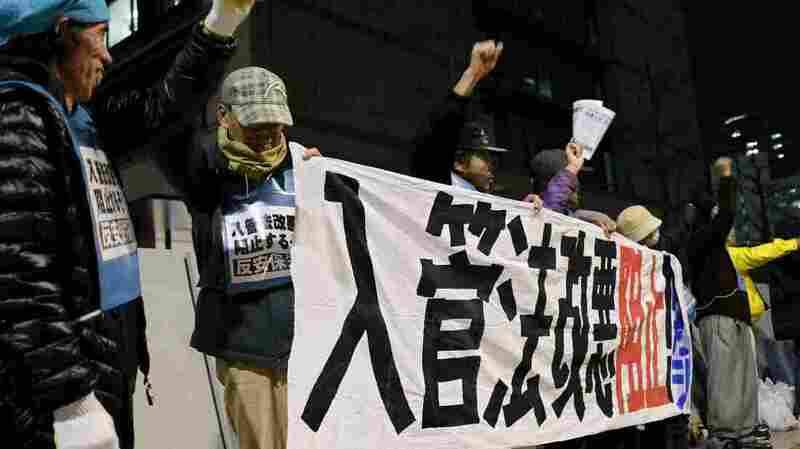 Japan's upper house of parliament passed the law 161 to 76 just after 4 a.m. Saturday local time, after a day when the opposition parties tried to unsuccessfully to block the measure. The law will go into effect in April 2019. The legislation has been viewed as a last-resort measure by Prime Minister Shinzo Abe's ultra-conservative government to address a severe shortage of workers in 14 industries, including restaurants, nursing, construction and agriculture. According to the Associated Press, two categories of workers will be accepted, with conditions that will discourage them from trying to immigrate permanently. The law will apply to as many as 345,000 less-skilled workers who will be allowed to stay for up to five years, but not bring in family members. It will also permit higher-skilled workers to enter with their families for 10 years and will provide them a path to Japanese citizenship. Both categories will have requirements for Japanese language competency. Japan's population is expected to decline from about 127 million to about 88 million by 2065, according to the National Institute of Population and Social Security. In September, Japan's Internal Affairs and Communications Ministry released data showing that for the first time, one in five people in the nation is older than 70. Japan has felt the pressure of an aging population and declining birthrates for decades. The government has tried to meet labor shortages by encouraging more employment of women and older workers, and using more robots and other automation. And it does have foreign workers. Their number has more than doubled since 2000 to nearly 1.3 million last year, out of a working-age population of 67 million, according to the AP. "Workers from developing Asian countries used to stay mostly behind the scenes, but not anymore. Almost all convenience stores are partly staffed by Asian workers and so are many restaurant chains." Many foreigners are working in Japan on training visas "that don't allow them to switch jobs even if they are abused or underpaid," says The Wall Street Journal editorial board. Thousands of student visa holders also work in Japan, often for longer than the 28 hours a week legally allowed. But until now the government has resisted opening the door to a legal influx of semi-skilled foreign laborers, as many Japanese, particularly Abe's right-wing supporters, fear a loss of cultural distinctiveness and homogeneity. It's one reason the government has been careful not to characterize the new visa program as immigration. But, as The Washington Post reports, Abe's government is "closely entwined with the business community, and the message it hears from every quarter — shipbuilding and construction, agriculture and fishing, elder-care establishments and convenience-store owners — is ever more insistent: We need more workers." A report by Tokyo Shoko Research showed the number of bankruptcies in Japan caused by staff shortages doubled between 2016 and 2017, according to The Wall Street Journal.